What's The Point of Darpa's 'Flying Humvee,' Exactly? 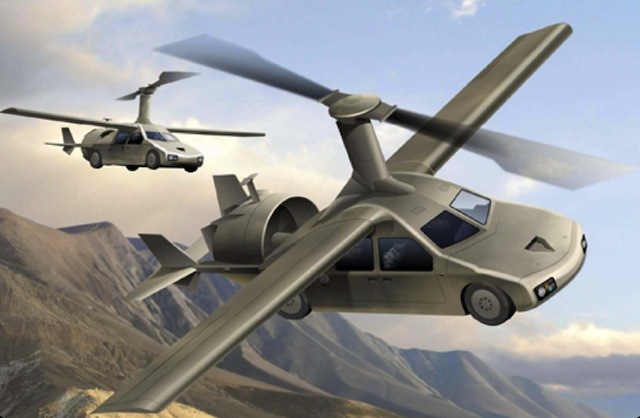 This is Lockheed Martin’s design for a bizarre mashup of plane, helicopter and Humvee called the Transformer. 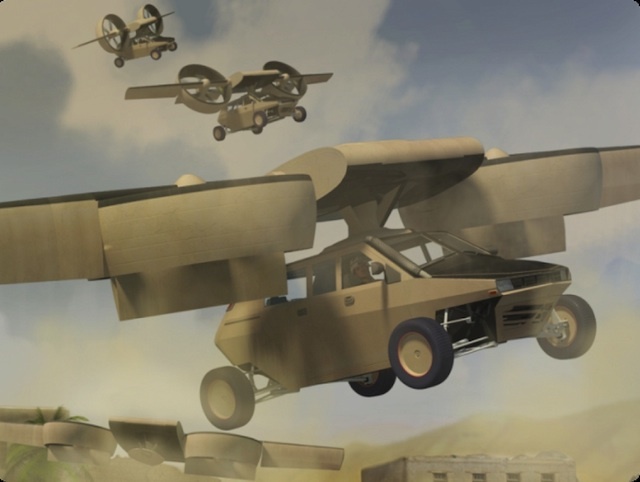 Dreamed up and funded by the Pentagon’s futurist researchers at Darpa, the Transformer is the answer to the long-standing dream of a flying car. Now Darpa says that such a roadable aircraft is inching closer to reality. Aresreports that Darpa considers two designs for the Transformer to be technologically feasible: one from Lockheed and another from AAI, which got $3 million last year from Darpa to develop a design. Next up: a “preliminary design review” taking place by next fall, after which Darpa will select one of the companies to develop a prototype by 2015. We’ll believe it when we see it. For one thing, Darpa wants the Transformer to do a lot. It’s got to take off — vertically — and be flyable by non-pilots. It’s got to both be armored enough to handle small arms fire and fuel-efficient enough to carry up to 1,000 pounds of freight for 250 miles on a single tank of gas. (Which is why AAI’s design, pictured above, incorporates a diesel engine.) And it’s got to seat four troops. And to be a spoilsport: It’s difficult to imagine a military problem that the Transformer actually solves. Darpa initially envisioned it as an answer to homemade bombs that disable ground vehicles; just glide above the ground to avoid the boom. But assuming that the U.S. is even involved in a land conflict after Afghanistan to make that problem salient, why wouldn’t insurgents plant those bombs to lure the Transformer into the air and then hit it with a rocket-propelled grenade or anti-tank missile? After all, the thing only has to stop small arms fire. Armoring it more seriously will add weight, imperiling its ability to stay aloft and stressing the fuel system. Would the Transformer come equipped with tiny anti-missile weapons? Outside of that, would the Marines use the thin-skinned Transformer as a ship-to-shore aircraft, replacing their longed-for swimming tanks as a way of storming an enemy beach? Other potential uses for the Transformer involve medical evacuation or (in an unmanned mode) resupplying troops, but existing vehicles already do that. For that matter, in an age of tight defense budgets, is it sensible to solve the problem of improvised explosive devices by building a hybrid truck, helicopter and airplane? Lockheed’s design is at least less of a helicopter. While its rotating ducted fans would allow the Transformer to take off and land vertically, like a helo, its wing design is fixed like an airplanes. AAI’s has both fixed and rotary wings, though its design weighs 500 pounds more than Lockheed’s. Not included in either design so far: a purpose.